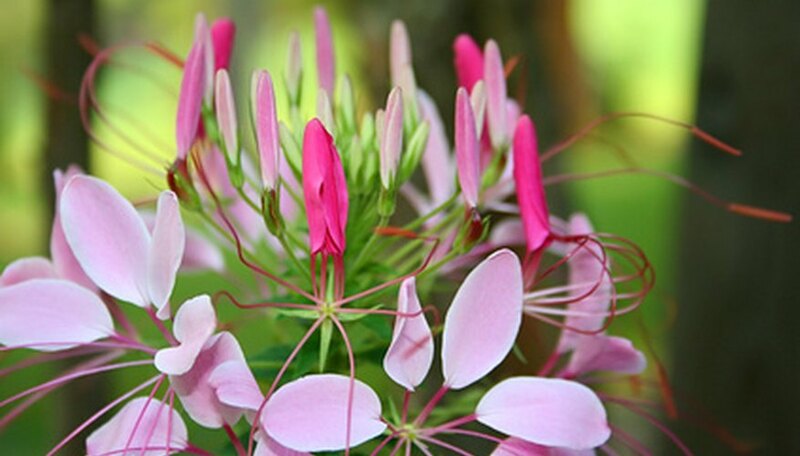 Cleome, popularly called spiderflower, is an exotic, dramatic annual that provides a colorful addition to the flowerbed or border. Cleome is a vigorous, hardy, pest-free plant that has earned its reputation as a reliable cottage-garden staple. Cleomes produce upright stems bearing clusters of white, pink or lavender flowers from midsummer until frost. Plant heights range from 3 to 6 feet, with a spread of 2 to 3 feet. They are best placed at the back of a border. Spiderflowers are fast growers that thrive in a sunny location, protected from wind. An undemanding annual, cleome should be planted in well-draining soil, as damp, heavy soil may contribute to root rot. Cleome is a sturdy annual, rarely bothered by insects or disease. They appreciate a good watering during prolonged dry weather. Fertilize periodically. Cleomes are prolific self-seeders. There is no need to deadhead fading flowers, but do thin seedlings on a regular basis. Cleomes get their nickname from their long, airy stamens. Their graceful, showy flowers make them attractive cutting flowers. Cleome stems are spiny and somewhat sticky, so be careful when handling. Additionally, the flowers have a distinct fragrance, which some people find unpleasant. Remove spent cleome flowerheads as they wilt and begin to die throughout the season. Use sharp, clean scissors to cut a browning flowerhead from its stem. Deadheading will prolong the blooming period. If you allow the dying flower to form seeds, the plant won’t bloom for you anymore. Pick up cut spent flowers--don’t leave them lying in the garden area. Look around carefully to see if you happened to drop any unnoticed seed pods as you were clipping. Dispose of cleome waste material--don’t add it to your compost heap. Deadhead cleomes throughout the season, but leave the final fall flush of bloom on the plants if you wish for them to reseed for next spring. Spider flowers are large, sturdy plants that grow from 3 to 6 feet tall. The palmate leaves have five to seven leaflets, and the stems have spines. Some newer varieties do not have spines. Spider flowers have claw-shaped petals and long stamens that resemble a spider. The fragrant flowers bloom in shades of purple, pink and white. The blooms begin at the lower end of the stem and continue opening to the top of the stem. Linde Armstrong is 18 to 24 inches tall with pink flowers. Helen Campbell has pink flowers on 2- to 3-foot plants. The sparkler series grows to 3 feet, the color fountain series reaches 4 feet, and the Queen series grows to 5 feet. Spider flowers may be called Cleome spinosa in some older references. Spider flowers grow in the sun in the moderately dry soil. They should be spaced 15 to 18 inches apart. They reseed easily in zones 8 to 11. Aphids, spider mites and white flies may damage the leaves and blooms of spider flowers. The plants are susceptible to downy or powdery mildew, fungal spots and rust. Soak cleome seeds for 24 hours. To do this, leave them on the counter in a bowl of water. Take your freezer container and layer the bottom with 1/2 inch of wet sand. You want the sand to be wet, but not slushy, and the container type that works best is a rectangular shape that is only two inches tall. Any shape, however, can work, and the size will depend upon how many cleome seeds you have. Put your cleome seeds on top of the layer of sand, and then cover them with another 1/2-inch layer of sand. Place the container in the freezer for four weeks and then move the container to the refrigerator until you are ready to sow. Prepare the planting bed by removing any weeds, rocks and other debris. Use the gardening fork to dig into the soil to a depth of 6 inches, turning and crushing it. Add a 3-inch layer of compost to the bed and mix it to a depth of 6 inches. Rake the area until it is smooth and level. Scatter the cleome seeds on the surface of the soil and cover them with 1/4 inch of sand. Water the area with a fine mist or a soaker hose to avoid washing away the seed. The soil should be moist, not soggy. Keep the soil moist until the seeds germinate, which should occur within 10 days of planting. Choose a spot to plant the seeds. Cleomes do best in full sun or partially shaded conditions. Remove any weeds or rocks from the chosen area if necessary. Fill a spray bottle with water. Mist the soil with water so it is damp to the touch. Cleomes do best in damp soil, so try to prevent the soil from becoming soggy. Lay the seeds down on top of the soil. The seeds should be evenly spaced 3 to 4 inches apart from one another. Press the seeds into the soil, but do not cover them as they require light to germinate. Mist the soil every morning if the soil is dry. The cleomes should germinate in one to two weeks. Harvest the darkened seed pods from the mature plant by snipping them off with shears. The pods will be dark brown, nearly black and may have begun to split open. Open the pods and sprinkle the seeds on to a plate, paper towel or tray. Let the seeds air dry for at least 24 hours. Pour the dried seeds into a dry, clean glass jar or in an envelope to be placed into a sterile plastic covered container. Label the storage container with the words "Cleome seeds" and the date of harvest. Store the containers in a cool, dark and dry place.